They emptied out the van last week, removed the wheels and hoisted it onto a trailer. It looked hollow, tired and a bit lopsided. You couldn’t see the stories it contained, the adventures, the accumulated trips and experiences and conversations stuffed to the ceiling, seeping out the doors and trailing behind as it was hauled away. It was a big piece of red and white metal that rattled and clanked and devoured too much gas, but it was much more than frame and wheels and seats. 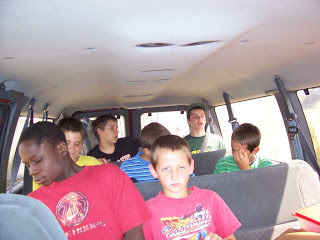 Back in 2000, we needed a big family vehicle because we had five children and, with Paul being both pastor and church school principal, we often wanted to transport lots of children besides ours. My parents were visiting at the time, and we took them along to Portland to look at this 1992 Ford Club Wagon. Mom, as I recall, mended my sons’ jeans as we drove. Dad was impressed with Paul, who not only knew what questions to ask the dealer but also paid for the van in full that day. We located a vinyl mat, shaped to fit, that could be swept and washed. Whenever I swept sand out of the corners after a trip to the coast or wiped up sticky Mountain Dew puddles after a school field trip, I was grateful I had insisted on taking out that impractical carpet. For years, we took the family to church in the van on Sundays and filled it with school children twice a day during the week. Even when the roads were icy, I could safely haul the children to and from school. Despite its ungainly size, the van was cooperative and easy to handle, like a gentle Clydesdale. I could tell that it liked me, so I liked it back, and we got along well. I even drove it to Portland, full of sisters-in-law, when we went secondhand shopping on 82nd Avenue, and then back home again, stuffed with Value Village and Deseret Industries bags and also laughter, empathy, and shared stories of life with Smucker men. When I walked out of WinCo every other week with two heaped and heavy shopping carts, pulling one and pushing the other, the van always was easy to spot in the parking lot, its red top rising head and shoulders above the other vehicles. I could easily fit the groceries inside, but I had to do it strategically or the bags would topple and the soy sauce bottles and cans of pineapple would roll away under the seats. We loaned it out to Gospel quartets touring churches in the Northwest, to Uncle James and Aunt Orpha when their children came home for visits, and to the church youth group to take on mission trips to Mexico. When Paul’s cousin Caroline and her family flew in from Ohio and borrowed it, they were driving on Interstate 84 near Multnomah Falls when a rear wheel suddenly came off. Somehow they pulled safely to a stop while the wheel and tire plowed through blackberry bushes and vaulted over the railroad tracks, never to be seen again. It soon was repaired, but the miles accumulated, and the dents and rattles increased. 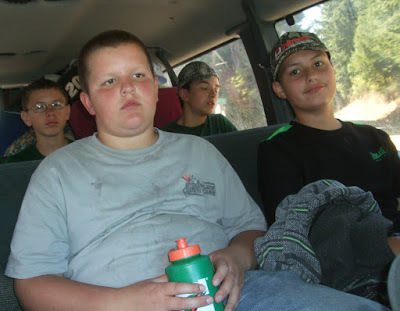 For almost 20 years, we hooked either a pop-up camper or a trailer of gear to the hitch, loaded the seats with hyper children and patient adults, and left for three days of Bible Memory Camp, our church’s reward to the 9- to 14-year-olds who memorized 50 Bible verses. Two or three times a year, Paul stuffed the van with students and took them on field trips — to OMSI in Portland, almost every year; to Mount St. Helens to the north and the Wildlife Safari to the south; to the aviation museum in Eugene and the carousel in Salem. Once every winter, I set a bucket of homemade hot chocolate mix and a large insulated tub of boiling water in the back, and Paul drove the school kids to Tombstone Pass to play in the snow. Soggy mittens and socks lurked under the seats afterwards, and sticky cups and crumpled lunch bags. We drove on long trips as a family, sometimes with an extra cousin or two. On the way home from a Christmas trip to Minnesota, we inched along an icy Wyoming highway while the teens in the back seat quietly repeated the 23rd Psalm until we finally reached a safe place to spend the night. Our daughter Amy and her friend Carrie cooked for a harvest crew one summer and used the van to haul groceries from the store and hot food to the field. One evening, our huge old dog, Hansie, disappeared. Overnight and into the next day, we worried and searched. Finally, I felt a strange compulsion to look inside the van. I slid open the door and there he was, having slipped inside and behind the back seat while Amy was unloading groceries. In an old photo, I see our children climbing into the van, parked under the oak tree on a snowy day, with Hansie looking on. Acorns dropping on the roof of the van were always the sign of summer’s end. One night, the oak tree quietly fell over, sprawling its gnarly branches over the driveway and yard, engulfing the van in its heavy embrace. 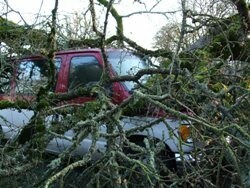 Miraculously, when the tree was cut up and hauled away, the van still could be used. We replaced the broken windows and tried to pry out the dents. It served us for another eight years. Soon after the tree fell, Hansie also collapsed. Friends helped me place him on blankets behind the back seat, and I drove him to the veterinarian to be put down. Then I drove him home to be buried, crying all the way. One by one, the kids grew up and bought their own cars. We still loaned out the van, but it grew less and less reliable, and when the engine finally gave out, we decided it was too old to repair. A friend bought it and hauled it away to be recycled. A faithful and reliable means of transportation is no small thing, nor is taking a group of people from here to there and back in warmth and safety. The van was the Lord’s, but the experiences were ours, and the travels and destinations. The stories are ours as well, and all the conversations, and 18 years of memories still trailing on behind. I thoroughly enjoyed your story about your van. I have a 2005 Buick LeSabre, that has been with us for every Army move and vacation, except Korea. It has 170,000 miles now, and I love it. In fact, I like it so much, that when we traded it in, I went and bought it back four months later:-) Thank you for sharing your memories with us. That is funny! But I fully understand your buying it back! Thoughtful and nostalgic because the van was the Lord’s and the writer brought it to life. I will never look at our vehicles the same=). Thanks Dorcas! I like that. I could be wrong, but I felt like our van, because it was the Lord's, survived a lot more than a normal van would have. As usual, your story is touching. Your van, like a steady and faithful old friend, heard all conversations, but repeated no secrets. It may even have wept with you on that final painful trip with Hansie. The picture of the children and Hansie leaving tracks in the snow in your driveway is a priceless keepsake with the van in the background. I also especially like the picture where the gnarled old branches of the fallen tree seem to embrace the van as if in a farewell hug (eight years early). Thank you for sharing.